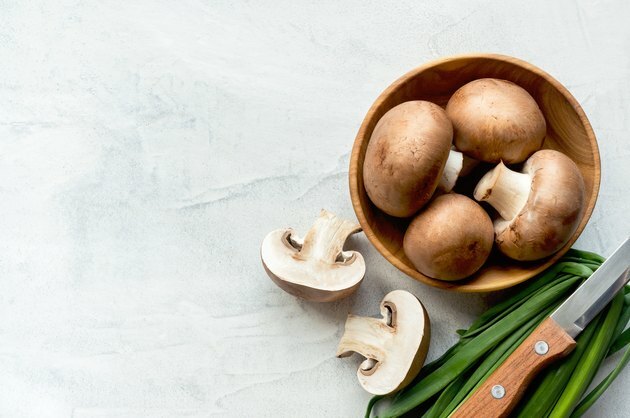 The mushrooms you might see on your supermarket shelves — cremini, shiitake, portobello — are not only harmless, but very healthy. Mushrooms are a rich source of many vitamins and minerals, dietary fiber and plant-based protein. While it's possible to get too much of some of these nutrients, you would have to eat a ton of mushrooms — and most people can't stomach that. When it comes to mushroom nutrition, they have plenty to offer. They're a low-calorie food, with portobello and cremini mushrooms providing 50 calories per cup. Shiitake mushrooms are a little higher in calories, because they have a slightly higher fat content, but they still provide only 77 calories per cup. The shiitake fat content is still low, with about 1 gram per cup, and it's primarily the healthy monounsaturated and polyunsaturated fats that help lower cholesterol and reduce the risk of heart disease. Portobello and cremini mushrooms both have less than a gram of fat per cup. The carbohydrate count in mushrooms is moderate — between 9 and 15 grams per cup. Up to one-third of those carbs are dietary fiber, an important part of your diet that aids digestion, weight management and cholesterol control. Women need at least 25 grams of fiber and men need at least 38 grams each day. One cup of shiitake mushrooms provides 5.5 grams of fiber, and there are 3 grams and 1.5 grams of fiber in a cup of portobello and cremini mushrooms, respectively. Mushrooms are also a surprisingly good source of protein, which supports muscle growth and repair and a strong immune system. Per cup, shiitakes and portobellos have 5 grams of protein, and creminis have 5.5 grams. Around 10 to 35 percent of your daily calories should come from protein. One cup of creminis provides between 3 and 11 percent of the daily protein requirement for the average 2,000-calorie diet. Mushrooms are an abundant source of B vitamins, which, as a group, play a large role in metabolism, energy production, nerve function and red blood cell formation. One cup of shiitake mushrooms provides 38 percent of a woman's recommended daily allowance (RDA) of riboflavin and 45 percent of a man's RDA. It also provides 55 and 63 percent of the RDA for men and women, respectively, for niacin; 70 percent of the RDA of pantothenic acid for both men and women; and 52 percent of the RDA for vitamin B6 for all adults. Portobello and cremini mushrooms provide similar amounts of the B vitamins, although they both provide more folate — 15 percent of the RDA on average — than shiitakes, which provide only 7 percent. Some mushrooms on store shelves have undergone controlled exposure to ultraviolet light, which makes them a good nonanimal source of vitamin D, a nutrient crucial for bone health. If you can find mushrooms labeled with this information, you can get the RDA for vitamin D — and then some — in a single serving. Both cremini and portobello mushrooms exposed to ultraviolet light provide as much as 480 percent of the 15 micrograms adults need daily. Mushrooms provide decent amounts of minerals like phosphorus, potassium and zinc. One cup of portobello mushrooms offers 35 percent of the RDA for phosphorus for both men and women. Phosphorus provides structure to cell membranes and plays important roles in bone mineralization, energy production and cell signaling. A cup of portobellos also provides 18 percent of the adult RDA for potassium — an electrolyte mineral that aids muscle contraction and nerve function — and 11 and 15 percent of the RDA for zinc for men and women, respectively. Zinc supports healthy immune function, wound healing and protein synthesis. Lets say you've decided to eat 10 cups of mushrooms in a day. You will easily exceed the daily recommendations for fiber, the B vitamins and vitamin D if you eat the kind exposed to ultraviolet light. After eating those 10 cups, you will have consumed up to 51 grams of fiber, up to 450 percent of the RDA for riboflavin, 630 percent of the RDA for niacin, 700 percent of your daily pantothenic acid needs and 520 percent of your daily B6. You might feel the effects of too much fiber — gas, bloating, constipation and stomach pain — but nothing that would make you seriously ill. The same applies for the B vitamins — mostly. B vitamins are water soluble, which means they're not stored in your body, and any excess is excreted in your urine. That's not to say excessive B vitamin intake can't cause problems. Taken in very large doses — over 200 milligrams per day — B6 can cause nerve toxicity. But you would have to eat 90 cups of portobello mushrooms in one day to reach that level. The same goes for niacin; daily doses in excess of 3,000 milligrams can cause liver problems. If you plan on eating 100 cups of mushrooms per day, you might need to worry about this. Stick to 10 cups a day and you're fine. You're a little closer to running into problems with your 10 cups when it comes to vitamin D. Taking more than 60,000 International Units (IU) of vitamin D per day can cause toxicity. That's the amount in 24 cups of portobello mushrooms exposed to ultraviolet light. Vitamin D toxicity can cause vomiting, weakness, frequent urination and, potentially, bone pain and kidney problems. If you eat 10 cups of mushrooms per day, you're also getting a lot of phosphorus — 350 percent of the RDA. With 2,400 milligrams of phosphorus in 10 cups, you're getting close the the Upper Limit (UL) of 3,000 milligrams per day. This is the amount at which dangerous effects could potentially occur, but according to the Linus Pauling Institute, the risk is mainly for people who have kidney disease. Chronic high phosphorus intake may have detrimental effects for bone health, because it may impair vitamin D, which can reduce blood calcium levels. However, the Linus Pauling Institute reports this is primarily a risk when calcium intakes are low. The calcium-phosphorus ratio appears to be more important than phosphorus intake in and of itself.